Each year, thousands of young people shove their lives into suitcases and move to New York to make their dreams come true. The urban air is full of possibilities; every step down a new path is a sensory feast. They settle in, learn the subway system and acquire that blasé, nothing-can-faze-me New Yorker attitude. Life is great. And then people from home start visiting. Just how many times can you go the Statue of Liberty? Do even first-time tourists really enjoy this experience, with the intense press of crowds and the interminable lines? The New York City Board of Tourism expects 44.4 million visitors in 2006. Don’t become a statistic. Here are some alternative places that will give you a feel for the real New York, without the feeling of being surrounded by every other tourist in the city. Catch a glimpse of Lady Liberty from a fresher vantage point. 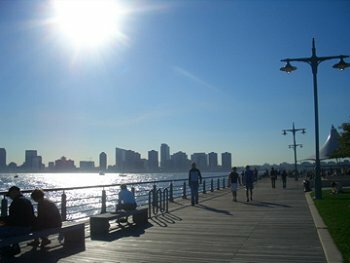 Walk south along the waterfront Hudson River Park near Pier 40, and enjoy the breeze, the view and the people-watching. Then explore the up-and-coming Meatpacking District nearby, where butchers and Barbies cross paths on wide cobblestoned streets. Check out the upscale designer boutiques. And stop at Little Pie Company for a slice of homemade pie à la mode. Owners Mike Deraney and Arnold Wilkerson keep the old-fashioned sweet spot small and personal. The shop’s been around for 21 years, and the house specialty, sour cream apple walnut pie, is “what made the store,” says employee Hunifred Gourgue, who enjoys her crumb-top pie with a heap of ice cream on top. Take a scenic subway ride uptown to The Cloisters, a branch of the Metropolitan Museum. It’s a mélange of original neo-medieval architecture and modern touches, and the only American museum dedicated to medieval art. It sits atop the 66 acres of a Fort Tryon Park, of the highest points in Manhattan, so you get a panoramic view of the city skyline and New Jersey shoreline. “You can sit, you can have a picnic, and you can actually hear someone, because it’s not overcrowded,” said Jessica Hallermann, a metropolitan studies major at New York University. Shuffling down 42nd Street with a herd of bewildered tourists might be a masochist’s idea of a good time, but you’ll probably enjoy the lights and life far more at intimate Union Square. The huge subway hub and famed Greenmarket draw chefs and vendors, artists and musicians, strollers and skateboarders. The area is becoming a foodie mecca, with a new Whole Foods and Trader Joe’s moving in; there are also plenty of fine restaurants, like Candela, a modern American restaurant with a (gasp) sushi menu. The park is especially alluring before Christmas, when it’s transformed into an outdoor holiday market. And at the Union Square Theatre, Off-Broadway shows mean Off-Broadway prices. Central Park is one of New York’s most overexposed spots, which can detract from its fun factor. For a parallel experience, step outside the borough box and visit Brooklyn’s Prospect Park, like its more famous sister also designed by Frederick Olmsted. “You still get all the crazies of New York, but in a quieter, friendlier environment,” says college student Sasha Awn. Like Central Park Prospect has its carousel, zoo, ice rink, lake, open fields and live summer concerts. And don’t miss the Brooklyn Botanic Garden across the street, where you can lounge under a stunning collection of blossoming cherry trees in the spring, or stroll in rose gardens in summer.